Well It may have been quiet around these her blog parts, but my household has been a hive of activity. Clicking the above image will take you to my flickr photos tagged with AEDM, of course I have been Creating a lot more than just these sketches. taught a bookbinding class and written the class materials! 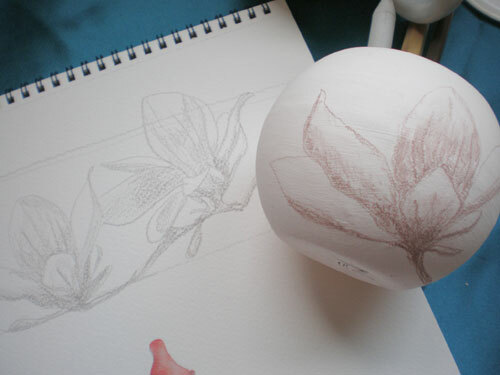 had three pottery classes where R. and I are trying to get things finished for christmas gifts. had a mini sketchcrawl with the group. played with some hand lettering – thanks to Roz for the inspiration, nothing to share yet, just playing. It’s been a bit of a stressful time at work with the economic downturn, we have had some downsizing which I have been so far unaffected by except for losing an assistant. In these times you have to have your outlets and give them the respect they deserve and not turn to the tv for distraction. So it’s a big Hurray! from me to Leah for encouraging us to create Art Every Day and reminding us to turn away fromt he box for a little while. Sample books for a bookbinding workshop I am hosting at CAE’s Streetpress gathering. Not art as such but I still spent the evening creating. My Contribution to Mathilda’s Moly for Moly X 45. Also today’s effort for AEDM. Leah Piken Kolidas is the pioneer of Art Every Day Month – I’ve decided to join up even though I know November will be tricky work wise and the temptation will be to curl up with a book to switch off my mind. While we were down at the beach over the Melbourne cup long weekend I only managed two pictures and succumbed to the reading demon. a little painting from blargowrie on the mornington penninsula in my moleskine watercolour book. a sketch from the Baths restaurant at Sorrento pier on the Mornington peninsula.